Due to our busy schedule with dogs, emails are preferred. Please send a detailed email to us at gildafgsd@yahoo.com if you have interest in purchasing a Vom Gildaf puppy or meeting our breeding dogs. All meetings are by appointment only and ALL appointments scheduled must be met on time or they will be rescheduled. Breeder of Working Line German Shepherds for Search and Rescue, Dog Sports and Families. Welcome to vom Gildaf German Shepherds. We have a home on 3 fenced acres in Southern Wisconsin. We are breeding some of the finest DDR (East), Czech and West working lines with an emphasis on health, temperament and work ability. All of our breeding dogs are Hip and Elbow certified by OFA or the German Rating system, CERF Certified and DM DNA Certified CLEAR. Our dogs must possess sound temperaments to make it in our breeding program. They are fed a fresh raw diet consisting of meats, vegetables, fruits and they are supplemented with Coconut Oil and ProBiotics. All of our dogs are raised in the home as part of the family, socialized to the extreme with people, dogs, children and various environments. All of our breeding and non-breeding dogs are available for potential puppy buyers to meet. While our main breeding goal is to produce healthy, sound dogs for Search and Rescue, versatility in our breeding dogs and puppies is emphasized. We have many dogs working in Search and Rescue, Tracking, Nose Work, Herding, Medical Alert Dogs, Schutzhund, Obedience, Flyball, Agility and other venues. 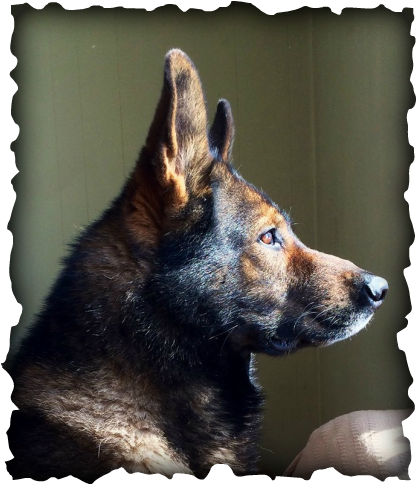 Melinda Clark is the owner of Vom Gildaf German Shepherds. She resides in southern Wisconsin with several German Shepherds and 4 Border Collies. Melinda is a professional Dog Trainer with several years experience as a Veterinary Technician, Shelter Manager of Humane Societies and Animal Control. Melinda currently spends her time at home with her dogs and puppies, working several dogs in Search and Rescue. She is a member of Minnesota-Wisconsin K9 Search and Rescue team and is actively deployed on searches. Take a few minutes to check out our website and see the accomplishments Melinda has made with her dogs. Some of her dogs have been top ranked in one sport or another in the U.S.A. and in Canada, winners of National events, on the Madison news for their successes and been invited for numerous demos. This website is a personal tribute to all the dogs that share in Melinda’s life. Dogs of today and dogs that are gone but never forgotten. They have all played a role in making many dreams come true and setting the stage for future stars. We do not sell to kennels, breeders or brokers. All puppies are sold on limited registration and are expected to be part of the family above and beyond anything. Enjoy our website and feel free to contact us with questions or comments. To see more on our Border Collies, visit our Website McQueen Border Collies. Vom Gildaf is now on Facebook! LIKE us to see updates on upcoming litters, progeny, accomplisments and fun photos! If you have a Vom Gildaf puppy, post your pictures on our Facebook page!